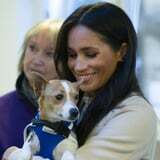 A Jack Russell pup called Minnie that no one wanted is now settling into a new forever-home after Meghan Markle gave her a cuddle for the cameras. Meghan was at The Mayhew Animal Home because she's just become its patron, and her visit showed that the very historic royal tradition of patronages remains a powerful tool in the 21st century. Confused as to what a patronage is? The official webpage for the royal family defines the custom as a member lending their name to an organization or charity and offering support, either for life or for a specific campaign or time frame. The tradition dates all the way back to King George II in the 18th century! Support allows organizations to add their royal backer's name to their website or letterheads and if often involves visits, which bring much-needed publicity to those who are chosen for a patronage. Meghan's four new patronages (she's also giving her support to the National Theater, the Association of Commonwealth Universities, and the charity Smartworks) have recently put a spotlight on this royal custom. The royal family get thousands of requests every year for members to become patrons of charities and groups and, even though Kate and Meghan might grab all the headlines, it's still the Queen who gets asked for her regal support most of all. Among the organizations with royal patrons are really famous charities like Save the Children (backed by Princess Anne) and smaller organizations like Wessex Heartbeat (which counts on the support of Sophie, Countess of Wessex). The Windsors also have over 570 patronages linked to the UK Armed Forces. The decision to take on a patronage is often a very personal one for the royals, and the places they choose to support are often working in areas close to their hearts. Meghan's love of animal rescue causes was reflected in her decision to back Mayhew, while the Duchess of Cambridge's deep interest in young people's issues can be seen in her choice to support organizations like the East Anglia's Children's Hospices. However, they are sometimes also carrying out traditions. Prince William gave his official support to the British Sub-Aqua Club in 2014, taking over from his dad, Prince Charles. And, the Prince of Wales had had the same role passed onto him by his own father, Prince Philip. William is known as the club's president, another name sometimes given to a royal patron. The current royal family has over 3,000 patronages between them, with the Queen and the Duke of Edinburgh holding over 1,000 of those. In recent years, Elizabeth II has started to pass on some of hers to younger members of the royal family. She handed two over to the Duchess of Sussex at the start of 2019 and famously passed on the patronage of the All England Tennis Club, home of the Wimbledon Championship, to the Duchess of Cambridge a couple of years ago. The Queen's decision to hand on these roles to the new generation reflects one of the main principles the House of Windsor has when it comes to patronages. The royals want to give as much support as they can to the organizations and charities they back, which means being able to devote enough time and energy to them. That's another reason why newer members of the family, like Meghan, tend to build their portfolio of patronages slowly, to make sure their backing is as effective as possible. And the difference that support can make was seen almost instantly in the case of Minnie the pup, who was taken off Mayhew's list of pets needing homes within hours of Meghan's visit. Royal patronages are a lot more than a link to the regal past: they are a way for the Windsors to continue to make a difference today.